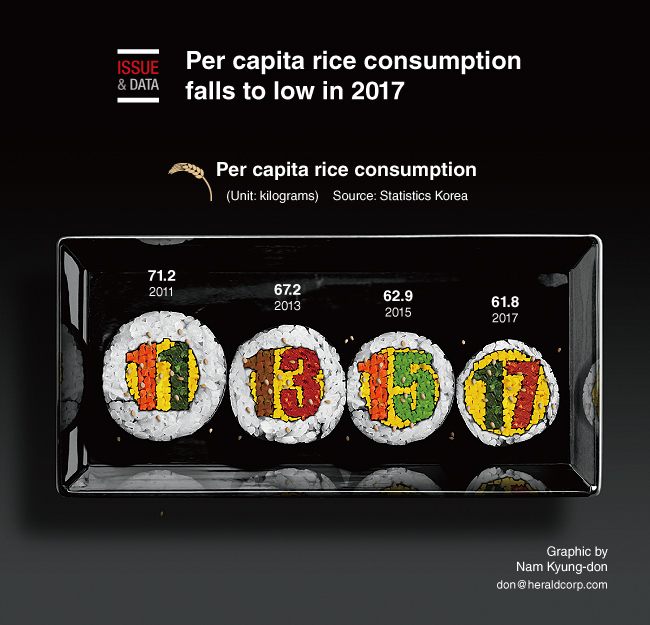 South Korea‘s per capita rice consumption hit a record low last year, government data showed. The average annual consumption of rice per person fell to 61.8 kilograms in 2017, down 0.2 percent from the previous year’s 61.9 kg, according to the data by Statistics Korea. Daily rice consumption per person also dropped to 169.3 grams last year from 169.6 grams tallied in the previous year, the data showed. Consumption of non-rice grains edged down 2.2 percent on-year to 9.1 kg in 2017 from 9.3 kg a year ago, accounting for 12.8 percent of the country‘s total grain consumption, the statistical agency said.